Hosting a bring-your-own-protein BBQ is my favorite way to party when the weather (finally!) heats up. I prep a bunch of sides in advance, we fire up the grill, and everyone can cook up their favorite meats or veggies at their own convenience. One thing I like to add to the mix is a dip bar. I prep a table filled with goodies, dips, and accoutrements that go perfect with grilled meats and veggies. 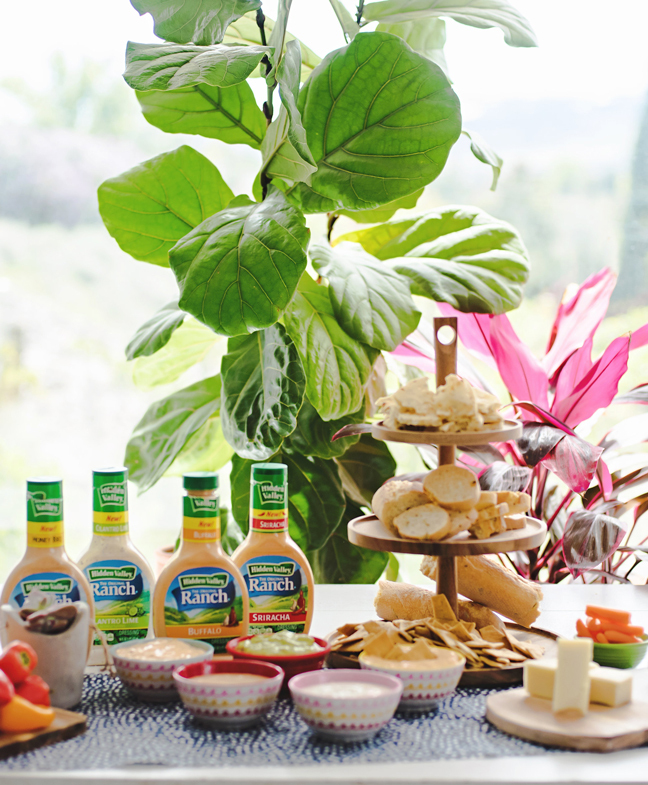 It feels totally unexpected—my friends are always impressed when they get to try out a new dip (or five…). First you’ll need to decide on the selection of dips you’ll be providing. 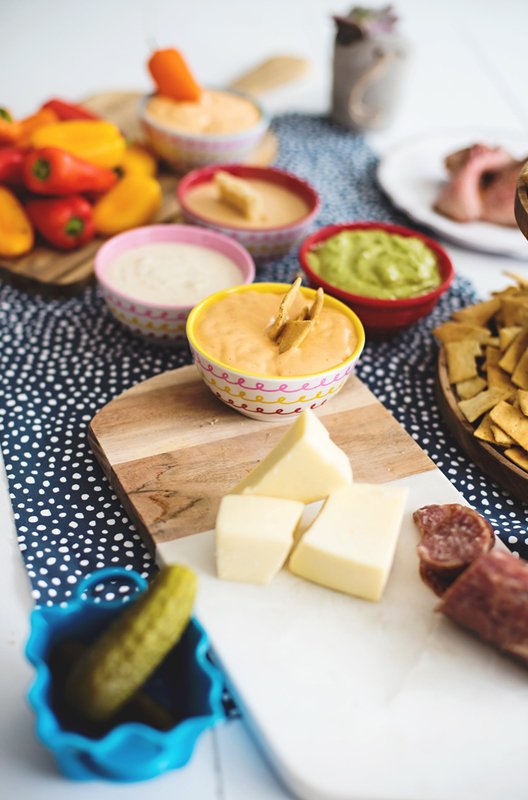 Mixing it up and having some more traditional dips like guacamole and hummus along with a selection of fun new flavors is a great way to get everyone trying them out and having fun. Be sure to fill the bar with lots of appetizer selections while the meat is cooking: breads, cut up veggies, and cheese will all go great with the dip selections. 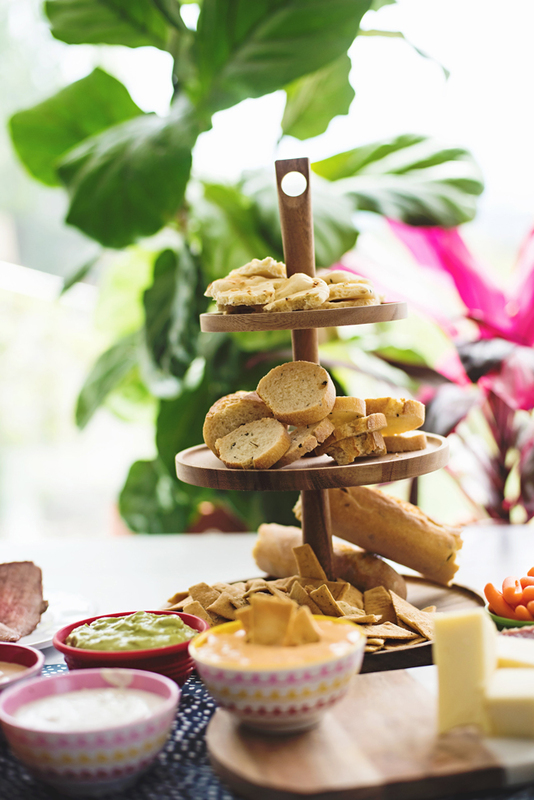 Keeping the dip bar set up through the party allows your guests to try out the different kinds of dips with whatever types of food they might like. You could even have a dip contest, or suggest everyone bring along his or her favorite dips to your next barbecue. 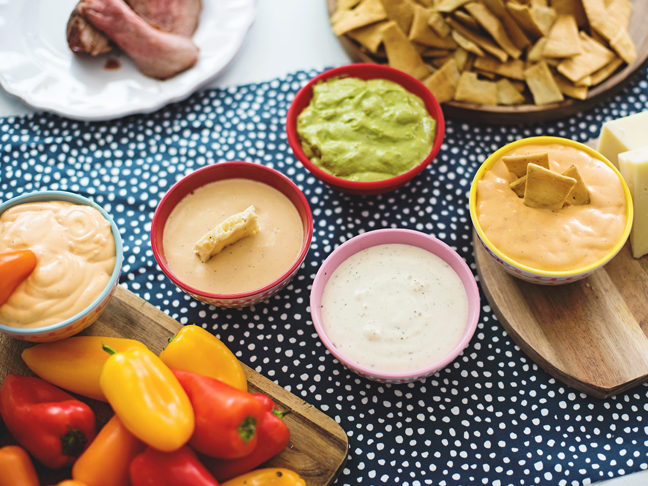 Once the meat is pulled off the grill, guests can choose their favorite dips to go along with it. From our dip bar I loved the Hidden Valley Buffalo Ranch Dressing with the steak and the guacamole with the salami and chips. It is really fun to try out different flavors with various cuts of meat. The best way to barbecue is to forget the hot dogs and instead focus on fun meats and a selection of different breads and veggies to go along with them. 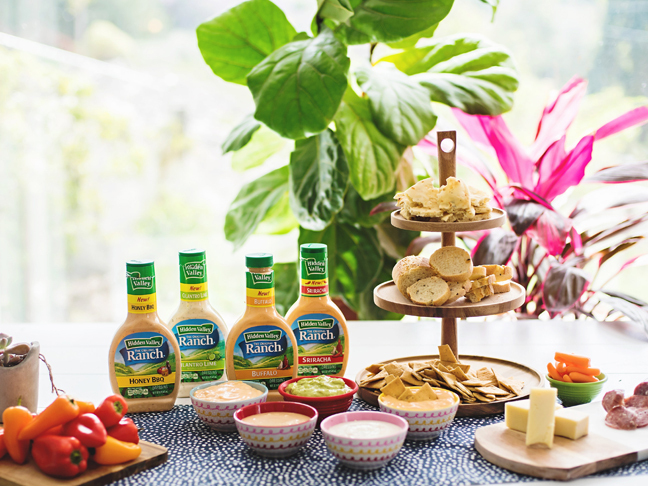 To save time and make party planning easy, we used a few favorite homemade dips and used Hidden Valley’s new flavors to round out the bar. It was so easy to squeeze the bottles in and end up with a selection of super unique dip flavors. 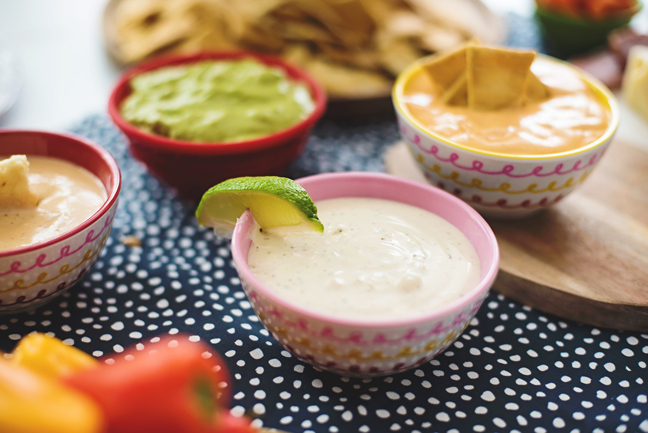 We accessorized the dips with things like a lime along with the Hidden Valley Cilantro and Lime Ranch Dressing and a pepper along with the Hidden Valley Sriracha Original Ranch Dressing. 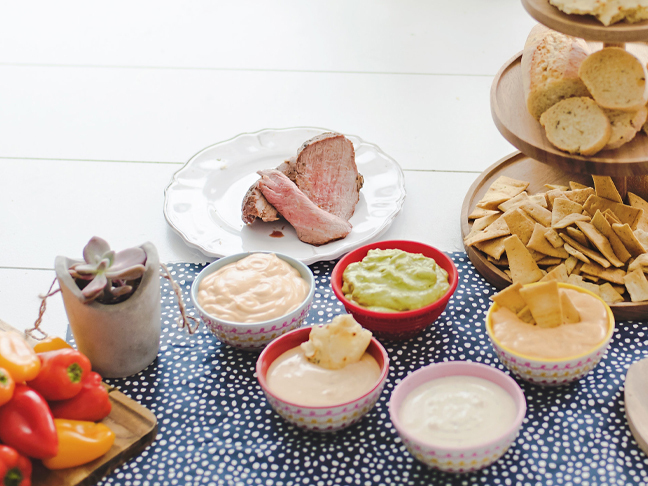 With flavors this tasty, no one will even be able to tell which were made at home and which dips were easily picked up at the store—making the DIY dip bar an easy party success. 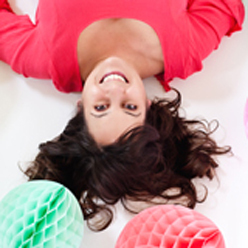 A note about food safety: For dips, make and enjoy your dip creation. Then, refrigerate within 2 hours or discard.